Comments: Evergreen broadleaf native to New South Wales and Queensland, Australia. P. undulatum have glossy dark green leaves with wavy edges and small white flowers. 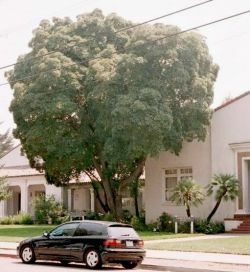 Usually a single trunk tree to 15', Pittosporum can also be trained to be a low growing hedge. Specimen at Niles Elementary is one of the largest in the area.